Have you taken a boating safety course or advanced boater education courses? Many marinas and yacht clubs in Southern California offer courses taught by the U.S. Coast Guard Auxiliary or the U.S. Power Squadrons. Chula Vista Marina, in south San Diego Bay, takes its educational mission much further. 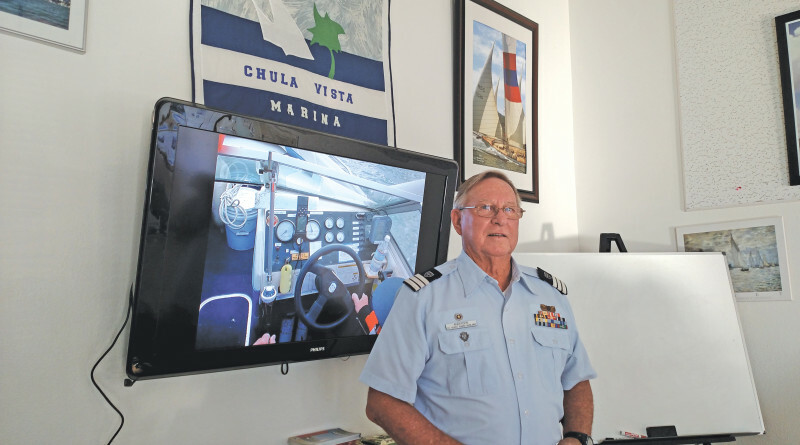 Mike Sullivan, Chula Vista’s dockmaster, greatly expanded the marina’s educational program when he took over as dockmaster five years ago, seeing a responsibility to help marina tenants learn how to operate and maintain their boats. “We get so many ‘newbies.’ We feel an obligation to provide boater education,” Sullivan explained. Many have just bought their first boat, he added, or a larger or different type vessel, often without prior applicable experience. Chula Vista’s education lineup includes regular Saturday boating safety, operation and maintenance and ham radio seminars, Wednesday night “armchair cruising” sessions (currently featuring showings of the classic “Adventures in Paradise” television series) and on-going Friday classes in Photoshop. Their boater education program can be a model for other marinas and yacht clubs interested in improving boaters’ knowledge and skills. I’ve sat in on several weekend marina programs, most offered free of charge except for materials fees. Chula Vista’s programs have gained a solid reputation around San Diego and attract attendees from throughout the region. The success to these programs can be attributed to two dedicated volunteers. Bill Andersen, USCGA flotilla staff officer for public education, is a retired Marine pilot and 15-year volunteer with the organization who also teaches at Shelter Island’s Southwestern Yacht Club. Don Johnson, a trained architect, former Navy Seabee and co-founder of the South Bayfront Sailing Association, which owns the 1971 schooner Bill of Rights, is a multi-talented natural instructor possessing broad boating knowledge. Twice a month Andersen arrives in full uniform to teach one of three USCGA-developed seminars, the two-day Weekend Navigator covering basic navigation skills; Suddenly in Command providing critical knowledge to crew or guests on how to handle the boat if the captain is unexpectedly disabled, and About Boating Safety, a two-hour introduction to key principles. At the January Weekend Navigator class, Andersen taught 16 eager students the basics of navigation, including using paper charts, plotting tools and the compass, understanding latitude and longitude and calculating speed, time and distance. Some class members, both sailors and powerboaters, were new to boating or returning after an absence. Others had five to 10 years on the water before realizing they had gaps in their knowledge. One attendee, who crews on a Shelter Island-based yacht, was sent by his captain to help prepare him for his own captain’s license exam. “The purpose of the classes is to promote boating safety for recreational boaters. Lots of people venture outside San Diego Bay and haven’t a clue what they’re doing. This gives them enough skills to make it to Catalina and back,” Andersen explained. Johnson, a skilled mechanic and boater who has repaired and maintained his own sailboats and now oversees maintenance and operations for the 136-foot tall ship Bill of Rights, offers wide-ranging boater seminars. In January he conducted a sewing workshop, focusing on constructing new sail covers, and in February his subject is marlin spike, covering common knots and lines. Last year I attended his session on weatherproofing your boat, which explained the use and choice of marine sealants. If you’re looking to improve your boating knowledge while learning from fellow boaters, or considering setting up a boater education program at your marina, Chula Vista Marina provides an excellent model. For schedule information, visit the organizations’ websites: USCGA at cgaux.org, USPS at usps.org and Chula Vista Marina at cvmarina.com.